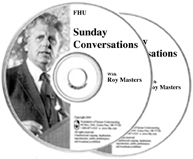 “The Man Who Found His Way"
This Sunday, Roy Masters has a conversation with a man who is searching. The man is open, honest and simple in his words. He asks questions as he finds his way and it pulls the best from Roy. So many of us hold back, not wanting to be wrong or look foolish. How do you get God in you? What does the creation of the universe have to do with meditation? There is so much contained here, you can listen several times. Roy looks at what things really mean. He recommends his 7-Minute Meditation but what is meditation really all about? What does being born of a woman really mean and what does it have to do with you? The right hand of God, your right hand, your brain...what is that all about? Where does your purpose come from? What does Jesus have to do with change? (This may surprise you). What you will find here goes far beyond any words you hear spoken. Roy says it clearly, "It is a conversation that is life or death". Please pass it forward; especially to our military. “Every soldier that uses it gets better”.